Traditional embroidered (and even woven) patches use thread to define the patterns of the patch design. While we can create a significant amount of detail using these methods, even more detail can be achieved by combining embroidery with dye sublimation. Dye sublimation doesn’t use thread – instead, we dye each molecule of our patch a certain color to create the design. Because this method is so precise, you can choose detailed patch designs to give your patch a more photo-like appearance. When you think of patches, you likely think of the traditional embroidered characteristic of patches. The embroidery method weaves thread into a substrate to give the patch a unique depth and weight as well as a classic look. When you choose combination patches, you won’t have to compromise for either embroidery or dye sublimation – you can have the best of both traditional and modern! If patches aren’t created through traditional embroidery, they’re usually woven or in some cases, dyed. All three of these patch methods have their own specific look, but don’t have a look that’s truly unique. With combination patches, however, you’ll get a patch that has the look of two different types of patches. 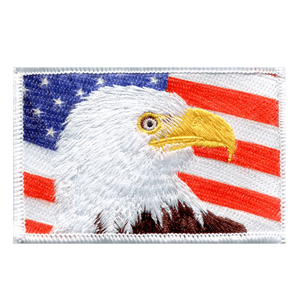 We can help you layer dye sublimation over an embroidered patch or incorporate embroidery into a dye sublimated patch. You’ll have a one-of-a-kind way to display your logo, event, artwork, and more.